A study of the territorial dispute between Japan and Korea over Liancourt Rocks, a small cluster of barren, rocky islets in the Sea of Japan that Japanese call Takeshima and Koreans call Dokdo. 2010 - Dokdo Institute of Yeungnam University admits Usando in Choson's official map of Ulleungdo(鬱陵島圖形) in 1711 is Jukdo, not Dokdo/Takeshima. Dokdo Institute of Yeungnam University admits Usando in Choson's official map of Ulleungdo(鬱陵島圖形) in 1711 is Jukdo, not Dokdo/Takeshima. Dokdo Institute of Yeungnam University(嶺南大学独島研究所) practically admitted Usando, which South Korean government has been claiming as Takeshima/Liancourt Rocks/Dokdo's old name since 1953, described in the detailed map of Ulleungdo "鬱陵島圖形", made and submitted to the King by official inspector Bak Seok-chang (朴錫昌) to Ulleungdo in 1711, was not Dokdo, but Ulleungdo's biggest neighbouring island Jukdo(竹島), which is 2-4km east to Ulleungdo in recent book. Prof. Kim Hwa-Kyung(金和経), the head of the Institute, wrote as below in their recent published book "Study for the establishment of Sovereignty over Dokdo"(독도 영유권확립을 위한 연구) (2010). As Prof. Kim quoted in the article, Prof. Oh Sang-Hak(呉尚學), whose expertise is Historical Geography had already admitted this in his article "The Change in Perception of Ulleungdo and Dokdo Represented in Maps of the Joseon Dynasty"(2006)". It was slightly before Gerry's pointed out that Usando in 1711 map is Jukdo since "Haejangjuk"(海長竹) is a kind of bamboo that cannot grow on Takeshima in the Japanese Newspaper San-in Shimpo on February 2007. 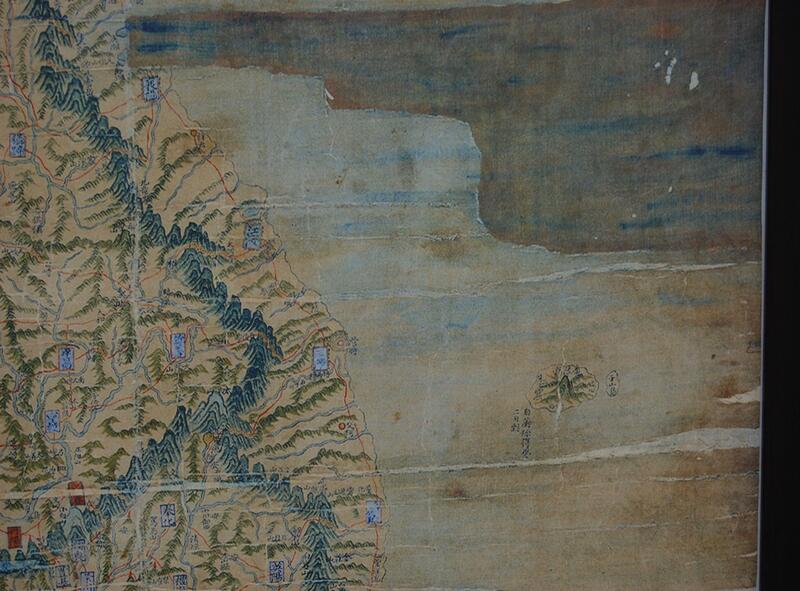 One of the maps, which is undated, shows a small island east of Ulleungdo with the following written on it: “The so-called Usando, fields of Haejangjuk.” It is pointed out that Haejangjuk is a kind of bamboo that cannot grow on Takeshima, which is essentially just a cluster of rocks where bamboo does not grow. Prof. Kim and Oh are not the only one who admitted Usando in the maps is Jukdo. In fact, Dokdo Museum Head also Admits Maps Show “Jukdo, not Dokdo” on March 20th, 2007. Korea’s Northeast Asia History Foundation rebutted to Gerry as well, while their argument was quite misdirected. The part that says, “The so-called Usando” is just written on the outline of an island, similar to four islands to the south, which is different from islets like Samseon Rocks and Elephant Rock on the north side of the island. Actually, there are no islands to the south of Ulleungdo. It is assumed that the map was not made from an actual survey, but was made based on hearsay. 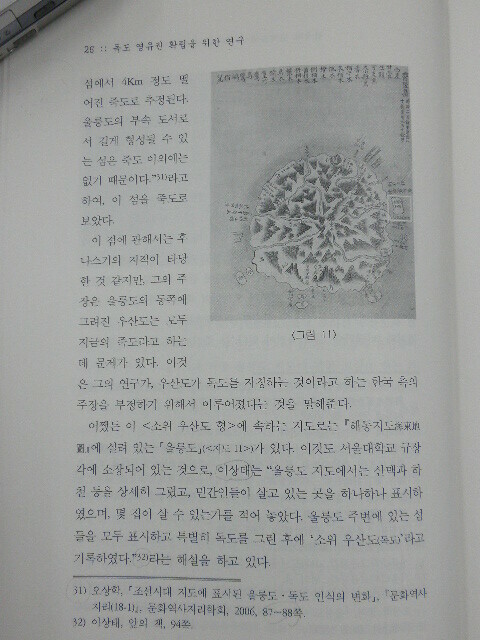 Concerning “haejangjukjeon, the so-called Usando,” it is believed that the inspector did not conduct a “concrete” investigation, but just followed the coastline and drew Jukdo (Bamboo Island), with its tall bamboo, and Usando (Dokdo), which was determined clearly at that time by the activities of An Yong-bok. If their explanation is true, then the map is rather the concrete evidence that official inspector of Joseon Dynasty who actually conducted the on the spot survey identified the shapes and location of Japan's Matsushima= U(J)asando by Ahn Yong-bok according to what people say and clearly recorded that Usando is not today's Takeshima/Dokdo, but Jukdo. Because Ahn Yong-bok testified that it took less than few hours for him to move from Ulleundo to Jasando, at dawn on 15th of May. Besides, Ahn said he "pulled the boat into Usando(拕舟入子山島)". It is natural for the inspector who went to Ulleugndo and saw Jukdo to identify it as so-called Usando. Whatever the island Ahn had witnessed was, it is apparent that both Joseon Dynasty and scholars out of office considered the island was Jukdo. Scholars out of office including Chŏng Sang-gi (鄭尚驥) who made "東国地図" and others who made the copies and Prof. Oh presume Chong put Usando east to Ulleungdo, namely the "exact" place of today's Dokdo according to Ahn's story, without any concrete evidence. But it is quite obvious as Chong and its follower's Usando is placed right next to Ulleungdo and it never go beyond the scope of the place of Jukdo, the Ulleungdo's neighbouring island of 4km east, which exactly matched with Ahn's testimony again. By the way, Korean academics mistranslated haejangjuk(海長竹田). "海長竹田" is not "long groves of bamboos alongside the coast" nor just a “grove of tall bamboo along the coastline", but is groves of "海長竹", a unique kind of bamboo. Japanese called it as 女竹. Japanese "Ministry of Foreign Affairs, Department of Trade, Document Section: Trade Documents" (外務省通商局編纂 通商彙纂) recorded that 女竹 grow on Jukdo in 1902. 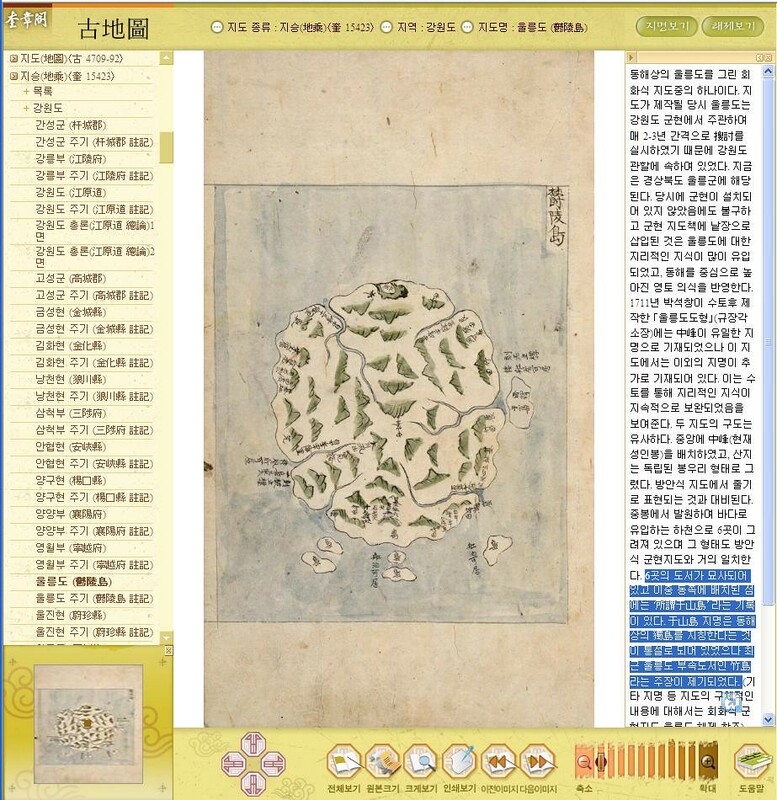 The inspector's map of Ulleungdo is Joseon's official maps and are the basis of other maps made thereafter. The map is one of the 6 Ulleungdo maps extant made by official investigators to Ulleungdo. The official maps of Ulleungdo as a result of regular inspection are extremely important in the history of Korea's geography since this is produced by officials and were positively used to produce the county prefecture map(郡県地図) of a nationwide thereafter such as "海東地図", "廣輿図". "朝鮮地図". And it is succeeded to the large reduced scale complete map produced in the 19th century thereafter. Actually, Seoul Nat'l University's Kyujanggak Institute of Korean Studies, who even strangely write Usando in this map is definately Dokdo, admits Usandos in some of the Ulleungdo maps "may be" Jukdo, not Dokdo on its website. Korea's claim that Usando in Korea's old maps are today's Takeshima/Liancourt Rocks/Dokdo is fake. As have been shown, Korean scholars gradually started to admit Usando in "The map of Ulleungdo" (鬱陵島圖形)(1711) and other Korea's old maps, especially after 18c are Jukdo, not Dokdo, while Korean government still keep claiming Usando had been Dokdo since 512 in its propaganda and reject Japan's proposal to bring the issue to the International Court of Justice. I honestly hope Korean government, academics, media & journalists, singer Kim someone, VANKers, netizens and some permanent residents in Japan accept this eternal fact that Korean had never considered Takeshima/Liancourt Rocks was their territory before 1905. Usando after 1711 official map of Ulleungdo were Jukdo and they should stop absurd claim such as Usando is Takeshima's old names from 512. Korean Scholar Says "Usando" Was Ulleungdo's "Jukdo"
The exhibition "East Sea and Dokdo in Old Maps " was held by the Northeast Asian History Foundation, that is research laboratories of the South Korea government, from this March 2 to the 9th at the the second floor of National Diet Library in South Korea. However, it made me feel that I was deceived by the extravagant advertisement, since there were only photographed panels in the hall not originals. According to the brochure distributed in the hall and the explanation of the hall, it seems they wanted to claim as follows. "Regarding the name "East Sea", it is notable that certain old maps printed in European countries such as Germany, Russia and the United Kingdom had used the name even before it was marked as such in the due sea area on some Korean maps for the meaning of "an east side of Eurasia" at that time." As for Takeshima, they also claim that "In the past, Korean called "Dokdo" as Usando, Sambongdo, Gajido or Seokdo", and " on those European old maps, Dokdo is referred to as 'Tchian-chan-tao', 'Liancourt Rocks', 'Hornet Rocks', 'Menelai' or 'Olivutsa'." They also seem to further claim that the label "East Sea" is correct for the Sea of Japan and Takeshima/Liancourt Rocks/Dokdo has historically been Korea's. However, again, there was no grounds of Korea's claim to show why Takeshima is Korea's and Japan Sea should be called East Sea. Though the brochure says that "the name "East Sea" was marked as East Sea in the due sea area", throughout the Joseon Dynasty, the area of East Sea which corresponds to indicates Yellow Sea(黄海), Bohai Sea(渤海) or the eastern seaboard of the Joseon peninsula and those areas don't overlap the area of the "Sea of Japan". How does the Northeast Asian History Foundation" who sponsored this exhibition take this fact? Their understanding of East Sea can be inferred from the explanation in the brochure, since they interpret the "Map of the Eight Provinces" (八道總圖 - 팔도총도) from "Sinjeung Dongguk Yeoji Seungram" (新增東國輿地勝覽 - 신증동국여지승람) as follows. "Map of the Eight Provinces" is the complete map of Joseon which is collected first in the "Sinjeung Dongguk Yeoji Seungram". It only recorded simple information that everyone know, such as prominent mountains, rivers, islands and seas, in order to prevent the top secret of the state." However, this explanation of "Map of the Eight Provinces" is only an arbitrary interpretation that neglects the document criticism. The postspcript of the map says "The complete map is a record for the ritual of worship(祀典)", meaning that the objects that the nation enshrines as spirits/godｓ of the nature are depicted in "Map of the Eight Provinces". Which means that the "East Sea" in not the label for the name of the sea, but for the places where the shrines of gods/spirits of the sea-waves along the eastern seaboards of Choson peninsula. 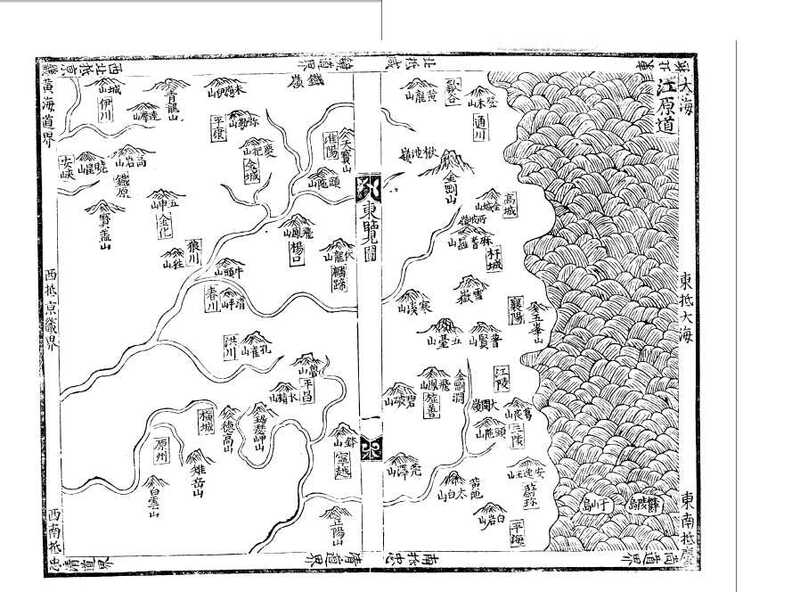 In fact, "The map of Kanwondo" from the same "Sinjeung Dongguk Yeoji Seungram" etc. labels the ocean as "東抵大海" (to the East, it reaches to the ocean) and "東北抵大海" (to the Northeast, it reaches to the ocean), making it clear that they are not coastal part, but the open seas far from the land. In short, the majority of the Sea of Japan area was recognized as "大海"(ocean), not "東海（East Sea）" in those old Korean maps. Moreover, the "East Sea"(東海) defined in the worship(祀典) can be also confirmed in the "Samguk Sagi"'s Monographs part (三国史記 雑志) that was compiled in Goryeo era. 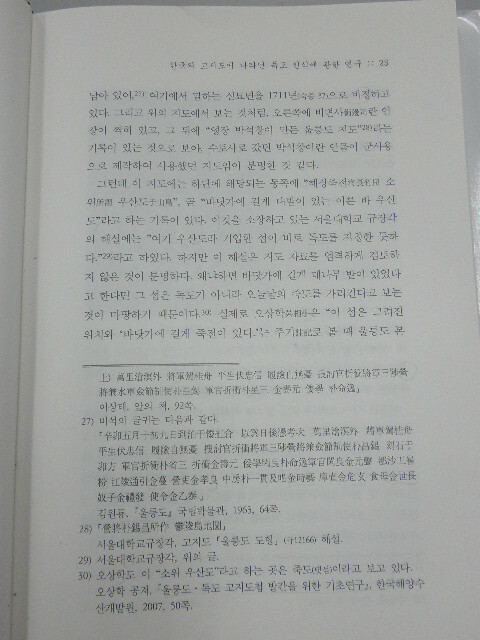 And it indicates the coast part of the Korean peninsula's east shore throughout the age of Silla, Goryeo and Joseon. Against this historical fact, Korea's Northeast History Foundation misread the Chinese character "東海", replacing with "日本海"(the Sea of Japan) in the modernistic way of thinking, and falsely claimed that "東海" in the maps are the historical evidence to show ancient Korean called the Sea of Japan as East Sea. However, it was after modern ages that the name's of the Sea of Japan as East Sea became general, and East Sea until a Joseon age indicated the coast part of the Korean peninsula east shore, Yellow Sea and Pohai. The similar example of their stretching interpretation "East Sea" far to the Sea of Japan can be seen in their explanation of "A Map of Marco Polo's Voyages" as well. The map was produced by British Emanuel Bowen in 1744 and it labeled the area as "EASTAN SEA" on the are of the Sea of Japan. They explained it is the evidence that western society called the Sea of Japan as East Sea in the brochure. However, as was explained, Korea's "East Sea" indicated the coastal part of Korean peninsula's eastern part, and it doesn't overlap with "EASTAN SEA" that corresponds to the Sea of Japan. And yet from the point that "EASTAN SEA" actually is written in "A Map of Marco Polo's Voyages", it should be translated rather as "Eastern Sea" or "Sea in the East" to follow the Marco Polo's "The Book of Marco Polo" which is nicknamed as " Oriente Poliano". But they explain it as "regarding the name "East Sea", it is notable that certain old maps printed in European countries such as Germany, Russia and the United Kingdom had used the name even before it was marked as such in the due sea area on some Korean maps" without any fact as such, in their brochure and the board on the hall. It is because there are overwhelmingly numbers of western old maps which label the sea area concerned to be "Sea of Japan", "Goryeo sea" and "Joseon sea", but "East Sea". Therefore, the exhibition "East Sea and Dokdo in Old Maps " will, on the contrary to their expectation the world to correct the Sea of Japan as East Sea, have proven the fact that East Sea claimed by South Korea doesn't overlap with the Sea of Japan. Keeping fabricating the history of the lie, and cheating the inside and outside the country only complicate relations between Japan and South Korea fruitlessly. This kind of political advertisement never leave an excellent result to future generations, but simple international reliability to South Korea is lowered and the stain is left for the history, . The same thing goes to their other explanation that "the claim by Japanese Government that Japan had owned Takeshima before 1905 is false" because "The map of the Great Japan", which the bureau of the staff of a Japanese army(日本陸軍参謀局) produced in 1877, does not depict Takeshima. This kind of sophistry comes from the disregard for the historical fact as is explained later. It is necessary to clarify to which of historical titles of Takeshima in Japan-South Korea to belong when the Takeshima Issue as the history issue is discussed. They dissemble as if Korea's historical base on Takeshima/Dokdo sovereignty is well-grounded, by explaining that Liancourt Rocks have been "called as Usando, Sambongdo, Gajido and Seokdo, etc..." and the islets were labeled as "Tchian-chan-tao、Liancout Rocks、Hormet Rocks、Menelia or Olivutsa, etc... in old western maps." However, unfortunately, there is anything that shows Korea's historical title on Takeshima at all. Although Korean claim that they called today's Takeshima as Usando, Sambongdo, Gajido and Seokdo, etc...", but that is absolutely groundless as I have already proved empirically in my article "A Study on the Name of Dokdo". Accordingly, as far as Korean has been keep failing to prove they had owned Takeshima/Dokdo before 1905, the year Japan officially incorporated Takeshima into Shimane Prefecture, Korea does not deserve to criticize Japan. The exhibition and their sophistry practically prove that they don't understand the historical background of Takeshima Issue at all. The origin of the issue can be traced to 18th January, 1952, the day Korean government installed the illegal delineation "The Syngman Rhee Line", encompassing the island of Takeshima and a large area of water with fisheries jurisdiction, over international waters. Afterwords, South Korea was yet able to prove it was historically Korea's territory, and all they talk was big brag "The territorial issue doesn't exist between Japan-South Korea", though the government of two countries exchanged memos, and repeated a formal controversy until the 1960's. This is the reason the government of Japan accuse Takeshima occupation in 1954 by South Korea to be an illegal occupancy. Korea's Takeshima/Dokdo Research has been carried out on the assumption that "Dokdo is our territory (Takeshima is South Korea's territory)", and they interpreted documents and old maps, which has no competence to prove the sovereignty in the first place, arbitrary to claim their legitimacy. 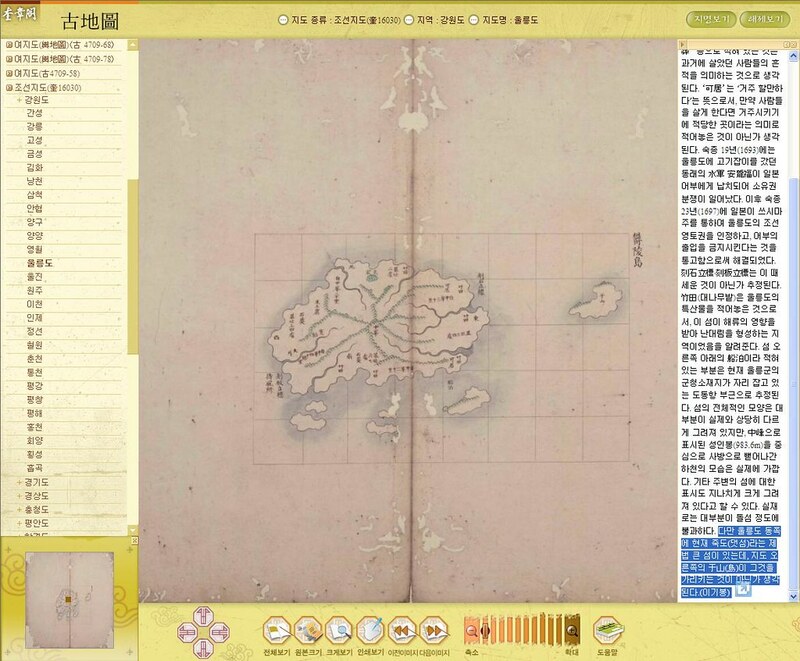 The exhibition "East Sea and Dokdo in Old Maps " fall under this category. The background why such events are repeatedly held is it originates in the fact that the past Takeshima controversy between Japan-South Korea was irregular. Although it is already proven that Takeshima was not Korea's territory in the view of history, there are two opinions concerning of the Takeshima Issue. Shimane Prefecture's Takeshima Research Center, that summarized the point of issue, concluded that Takeshima is Japanese territory on the ground the fact then Meiji government named Liancourt Rocks, of which there were no traces of occupation by any other countries / Terra nullis, and incorporated into a Japanese territory in accordance with International Law in 1905. While Ministry of Foreign Affairs of Japan concludes that Takeshima is Japanese territory from Edo period, from the details of the controversy by the exchange of memos of Japan-South Korea so far. Then, South Korea that wanted to refute the Japan's claim at any cost disregarded the opinion of the Takeshima Research Center of Shimane Prefecture and made the opinion of the Ministry of Foreign Affairs a subject of discussion. This time, they presented "The complete map of Japan"(大日本全図) as the grounds of an argument that the bureau of the staff of a Japanese army(日本陸軍参謀局) produced in 1877. According to their explanation, it supposed to be "the proof of Japanese Government's opinion that Japan had owned Takeshima before 1905 is false" since Takeshima was not depicted. However, it is natural that Takeshima that became a Japanese territory in 1905 doesn't exist in the map of Japan produced before 1905. No matter how maps that similar to this "The complete map of Japan" are collected, it hardly become any evidence to prove Takeshima is South Korean territory. South Korea's, who lacks empirical evidence to prove Takeshima is South Korea territory, claim that "Japanese government claim falsely" is just a propaganda maneuvers to justify their illegal occupancy of Takeshima. "False claim" is not on Japanese side, but on Korean side, who herself accuse Japan of false claim. In fact, there is Korea's deceit behind the words the brochure says, "Dokdo is referred to as 'Tchian-chan-tao', 'Liancourt Rocks', 'Hornet Rocks', 'Menelai' or 'Olivutsa' in western old maps." The name "Liancourt Rocks" originate from the fact French whaler Liancourt found the islets in 1849. "Hornet Rocks" originate from the fact that British warship H.M.S. Hornet identified them and plotted on the nautical-chart in 1855. "Menalai and Olivutsa Rocks" again originate in the fact Russian frigate Paleada have surveyed the island and named it Olivutsa(Оливуца) & Menelai(Менелай) in 1854. Accordingly, there are concrete reason that Takeshima/Dokdo was named as such in western old maps. The point is, "Tchian-chan-tao" (the sound of the Chinese word "千山島") is not today's Takeshima/Dokdo. "Tchian-chan-tao" in western old maps comes from "Map of the Eight Provinces" (八道總圖 - 팔도총도) in ”A Revised Edition of the Augmented Survey of the Geography of Korea” (新增東國輿地勝覽 : The Sinjeung Dongguk Yeoji Seungram)　indicates "千山島" and it does correctly indicates "千山島". However, "千山島" in "Map of the Eight Provinces" is the same island with different names of Ulleungdo, and it has no relationship with Takeshima in territorial dispute between Japan-Korea. "千山島" in "Map of the Eight Provinces" is depicted between Joseon peninsula and Ulleungdo, and it is apparent from the description of "Annals of King Taejong" (太宗實錄 - 태종실록) , which was quoted in ”The Sinjeung Dongguk Yeoji Seungram”, that it was another name of Ulleungdo. However, problem is, the incorrect geographical knowledge of "Map of the Eight Provinces" was followed suit by western old maps (Note by translater ; via China) and Usando, which is the same island/different name of Ulleungdo, imparted to as well. "Royaume de Coree" by French royal geographer D'Anville in 1737, which was on display at the exhibition, is one of those maps and it is the ringleader who confuses the Western old maps. "The Chart of Japan" by William Heine, who accompanied the first expedition of the US fleet under Commander Matthew Perry to Japan as an official artist/book illustrator in 1853, depicts three islands, "Takeshima"(Argonaut=non-existant),"Matsushima"(Ulleungdo/Dagelet), "Hornet Rocks"(today's Takeshima), plus two islands "Pan-ling-tao", which indicates Ulleungdo and "Tchian-chan-tao" which originates in "千山島" in the vicinity of the East coast of Joseon peninsula. Same goes to "（U.S) Navy Chart of the Coast of China 、Pacific coast (Asia), Japan islands Copied to ordered by Commandar Mattew Perry(1855)", a foldout map in "The Narrative of the Commodore Matthew Calbraith Perry's Expedition to Japan", and it depicts two Ulleungdos, namely "Dagelet or Matsushima"(=Ulleungdo) and "Pan-ling-tao"(=Ulleungdo), following the geographical knowledge of "Royaume de Coree" by D'Anville. The exhibition "East Sea and Dokdo in Old Maps " held by the Northeast Asian History Foundation arbitrarily decide ”Tchian-chan-tao” in "Royaume de Coree" by D'Anville is today's Takeshima, but in fact, ”Tchian-chan-tao” only followed the mistake of "Map of the Eight Provinces". Therefore, it can never become a evidence for Korea's sovereignty over Takeshima. Korean side claim Takeshima is their territory by arbitrary interpreting the documented source or old maps neglecting document criticism, however, this kind of claim, which lacks the technique of a fair historical study, is nothing but just a reckless remark. However, "Takeshima" and "Matsushima" in "The New　Detailed Map of Japan, Russia, China and Korea"(日露清韓明細新図) are phantom island "Argonaut" and "Ulleungdo", respectively, apparently from their longitude. Because, Ulleungdo had been recognized as "Matsushima" in Japan since about 1883(16th year of Meiji). The remote cause of the confusion is Philipp Franz von Siebold's map "Karte vom japanischen Reiche, nach Originalkarten und astronomischen Beobachtungen der Japaner die Inseln Kiusiu, Sikok und Nippon"(1840) , which depicts "Takasima (I. Argonaute)", the island of uncertain whereabouts (129°50" E) and Ulleungdo as "Matsusima (I. Dagelet)" (130°56" E). Therefore, after this Siebold's map, western maps and charts depict phantom island "Takeshima=Argonaut" and "Matsushima=Dagelet", which is Ulleungdo, and Japan followed it. Takeshima, which is currently occupied illegally by South Korea, locates at 131°55" E. Accordingly, it has nothing to do with "Take(a)sima" (129°50" E) nor "Matsusima" (130°56" E) in Siebold's map "Karte vom japanischen Reiche, nach Originalkarten und astronomischen Beobachtungen der Japaner die Inseln Kiusiu, Sikok und Nippon"(1840). Therefore, "Takeshima" and "Matsushima" in "The New　Detailed Map of Japan, Russia, China and Korea"(日露清韓明細新図) (1903) are phantom island "Argonaut" and "Ulleungdo", respectively, and it is also apparent from their longitude and latitude. For that reason, it is prejudiced opinion to disregard the fact of the history for Kim Hwa-Kyung(金和経), the head of the Institute, to have said that "It is the evidence Japan himself divided the border voluntarily recognizing the South Korean territory Dokdo". Takeshima/Liancourt Rocks, which used to be called as "Matsushima" by Japanese in Edo era, was officially named as "Takeshima" when it was incorporated into official Japanese territory in 1905, being switched by the old name of Ulleungdo, which used to be called as "Takeshima", because of mislabel of Ulleungdo as Matsushima in Siebold's map "Karte vom japanischen Reiche, nach Originalkarten und astronomischen Beobachtungen der Japaner die Inseln Kiusiu, Sikok und Nippon"(1840). "Takeshima" and another island = "Matsushima" of the Dajokan instruction, which Korean frequently takes up for a subject for discussion, simply meant that phantom island "Takeshima" and "Matsushima" as a another name of Ulleungdo, and it didn't instructed that today's Takeshima to be outside the territory of Japan. South Korean seems tend to interpret documents and maps recklessly in order to make Takeshima/Linancourt Rocks is Korea's territory. However, it is impossible and unreasonable for them to claim Takeshima which have never been their own territory in the first place, as their own. Finally, both the exhibition "East Sea and Dokdo in Old Maps" and the Dokdo Institute of Yeungnam University are interpreting documents and a part of the old map arbitrary, and fabricating the history of the lie. This kind of act will leave the wound with irreparable relations between Japan and South Korea. This is a reason to dare to give unpleasant but wholesome advice. Courtesy of Web Takeshima Research Center. The 23rd column " Refutation against the report of South Korean Yonhap News Agency which misread the Mori Kohan（森幸安）'s "The Map of Tsushima(對馬輿地図)"
The 16th column ""Dokdo Month" without any historical grounds." The 15th column " South Korea's Groundless Claim of "Inherent Part of (Korean) Territory"
The 14th column “A reckless Courage of the Professor Kimishima Kazuhiko(君島和彦) of Tokyo Gakugei University(東京学芸大学). The 13th column “Sins of Asahi Shimbun and Mr. Wakamiya Yoshibumi(若宮啓文). The 8th column “The Historical Facts" The 6th column “Onshu-shicho-goki (隠州視聴合記)" and the "Nihon Yochi Totei Zenzu (日本輿地路程全図)" by Nagakubo Sekisui(長久保赤水)"
The 5th column “South Korea’s erroneous interpretation of the document 'Takeshima and Another Island are Unrelated to Japan"
The 4th column “Errors in Educational Video Produced by the Northeast Asian History Foundation (東北アジア歴史財団)." 1880 - Japanese Warship "Amagi" (軍艦天城) Surveys Ulleungdo and finds "Takeshima" is Jukdo. 1881 - Kitazawa Masanari(北澤正誠), a official of MOFA concluded that "Takeshima" is Jukdo in "A Study of Takeshima (Takeshima Kosho 竹島考証) "
This satellite photo shows Ulleungdo's neighboring islands of Gwaneumdo (觀音島) and Jukdo (竹島) off Ulleungdo's east shore. Gwaneumdo is only about 100 meters offshore and looks more like a cape than an island. Jukdo is about 2 km offshore. The old Korean name for Jukdo was "Usando" (于山島), as many of Korea's old maps show. Koreans claim that Usando was Korea's old name for "Dokdo" (Liancourt Rocks), but they have no documents or maps to prove it. Also, Liancourt Rocks is about ninety-two kilometers southeast of Ulleungdo and are essentially two islands, but all of Korea's old maps show it as one island just off shore of Ulleungdo. Jukdo is a 51-acre (207,818 sq. meter) island that is approximately 2.2 km off the east shore of the Korean island of Ulleungdo (鬱陵島 - 울릉도). It appeared on old Korean maps most often labeled as "Usando" (于山島 - 우산도). This Korean map of Ulleungdo (鬱陵島 - 울릉도) showed it with a small island off its eastern shore labeled as "Usan" (于山). Hash marks at the bottom of the map showed that Usan was less than 4 km off Ulleungdo's east shore. That would mean that it would be Ulleungdo's neighboring island of Jukdo, which is about 2.2 km off Ulleungdo's east shore. Koreans claim that Usando was the old name for Dokdo (Liancourt Rocks), but Dokdo is 92 km southeast of Ulleungdo and is essentially two islands, not one. The map is stored in the National Library of Korea. This Korean map of Ulleungdo (鬱陵島 - 울릉도) showed Usan (于山 - 우산) as a neighboring island just off Ulleungdo's east shore. The hash marks at the bottom of the map showed the island to be about 4 km offshore. Usando was the old Korean name for Ulleungdo's neighboring island of Jukdo, which is about 2.2 km of Ulleungdo's east shore. Koreans claim that Usando was the old Korean name for "Dokdo" (Liancourt Rocks), which is 92 km southeast of Ulleungdo, but this map and many others prove that claim false. The map is stored in Seoul National University's Kyujanggak Center for Korean Studies. This map showed Ulleungdo (鬱陵島 - 울릉도) with a neighboring island labeled as "Usan" (于山 - 우산). Usando (于山島) was the old Korean name for Ulleungdo's neighboring island of Jukdo (竹島 - 죽도), which is about 2.2 km off Ulleungdo's east shore. Koreans claim that Usando was the old name for "Dokdo" (Liancourt Rocks), which is 92 km southeast of Ulleungdo, but this map and many others prove that claim wrong. The map is stored in Japan's "University of Tsukuba Library" (筑波大学附属図書館). This map of Ullelungdo (鬱陵島) is from the Korean atlas "Joseon-do" (朝鮮圖), which is believed to have been made sometime between 1800 and 1822. Ulleungdo is shown with a neighboring island labeled as Usan (于山). Koreans claim that Usando (于山島) was the old Korean name for Dokdo (Liancourt Rocks), but this map and many others show that it was Ulleungdo's neighboring island of Jukdo (竹島), which is Ulleungdo's largest neighboring island and only two kilometers off Ulleungdo's east shore. The map is stored in the Osaka Nakanoshima Library (中之島圖書館). This Korean map of Ulleungdo (鬱陵島 - 울릉도) showed it with a small island off its eastern shore labeled as "Usan" (于山). Grid lines help show the relative distance to the small island. Koreans claim that Usando was the old name for Dokdo (Liancourt Rocks), but Dokdo is 92 km southeast of Ulleungdo and is essentially two islands, not one. The map is stored in the National Library of Korea. The map showed "Usan" (于山) as Ulleungdo's neighboring island of Jukdo (竹島 - 죽도), which is about 2.2 km off Ulleungdo's east shore. Grid lines help show the relative distance to the small island. 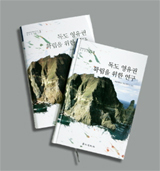 Koreans claim that Usando (于山島 - 우산도) was Dokdo (Liancourt Rocks), but Korea's own maps and documents prove that claim false. 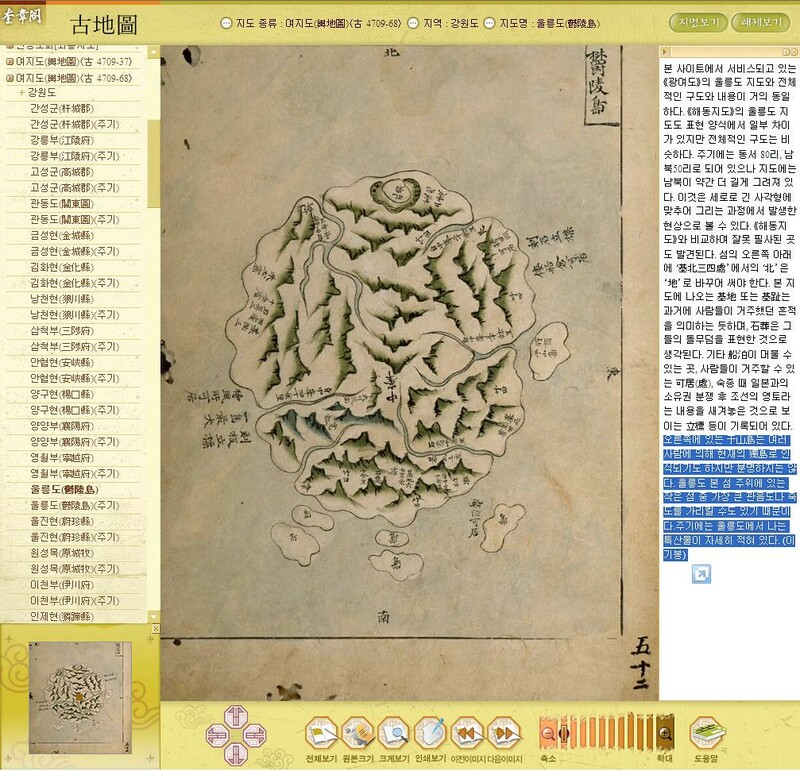 This map is stored in the Koryo University Library. This map of Ulleungdo comes from an atlas entitled "Gwandong Bangyeo" (關東方輿), which was probably made in the late 1800s since the map is very similarly to another map of Ulleungdo that was made between 1884 and 1894. The mapmaker used gridlines to help show relative size and distance. The map shows Ulleungdo with a small island off its east shore labeled as "Usan" (于山), which was the old Korean name for Ulleungdo's neighboring island of Jukdo (竹島 - 죽도). Jukdo is Ulleungdo's largest neighoring island and is about two kilometers off Ulleungdo's east shore. Koreans claim that Usando was the old Korean name for "Dokdo" (Liancourt Rocks), but they have no maps or documents to prove it. The map is stored in the Korean National Library. This Korean map of Ulleungdo (鬱陵島 - 울릉도) showed "Usan" (于山 - 우산) as a neighboring island. The grid lines on the map helped show the small island's relative distance from Ulleungdo. Usando (于山島 - 우산도) was the old Korean name for Ulleungdo's neighboring island of Jukdo (竹島 - 죽도), which is about 2.2 km off Ulleungdo's east shore. Korean's claim that Usando was the old name for "Dokdo" (Liancourt Rocks), but this map and many others prove that claim false. The Korea map shows Ulleungdo with a small neighboring island off its east shore labeled as "the so-called Usando" (所謂 于山島). Koreans claim that Usando was the old name for Dokdo (Liancourt Rocks), but Dokdo is 92 km southeast of Ulleungdo and is essentially two islands, not one. The map is stored in Seoul National University's Kyujanggak Center for Korean Studies. The Korea map shows Ulleungdo (鬱陵島 - 울릉도) with a small neighboring island off its east shore labeled as "the so-called Usando" (所謂 于山島). Koreans claim that Usando was the old name for Dokdo (Liancourt Rocks), but Dokdo is 92 km southeast of Ulleungdo and is essentially two islands, not one. The map is stored in the National Library of Korea. This Korean map of Ulleungdo showed it with a small island off its eastern shore labeled as "the so-called Usando" (所謂 于山島). Koreans claim that Usando was the old name for Dokdo (Liancourt Rocks), but Dokdo is 92 km southeast of Ulleungdo and is essentially two islands, not one. The map is stored in Seoul National University's Kyujanggak Center for Korean Studies. This Korean map of Ulleungdo (鬱陵島 - 울릉도) showed it with a small island off its eastern shore labeled as "the so-called Usando" (所謂 于山島). Koreans claim that Usando was the old name for Dokdo (Liancourt Rocks), but Dokdo is 92 km southeast of Ulleungdo and is essentially two islands, not one. The map is stored in the National Library of Korea. This Korean map showed Ulleungdo's neighboring islands of Jukdo and Gwaneumdo labeled as "Big Udo" (大于島) & "Little Udo" (小于島), respectively. The map was drawn upside down in relation to the writing on the right side, so the neighboring islands appear on the left side of Ulleungdo. This map is displayed in Korea's Samcheok Museum. This inspector's map showed Ulleungdo's neighboring islands of Jukdo and Gwaneumdo labeled as "Big Gando" (大干島) and "Little Gando" (小干島), respectively, The "gan" (干) was probably supposed to be "U" (于), as in the name Usando (于山島). Stored in the National Library of Korea. The map is an inspector's map that showed Ulleungdo with an island off its east shore labeled as "the so-called Usando" (所謂 于山島). The small island was also labeled as having "fields of haejang bamboo" (海長竹田). Koreans claim that Usando was Dokdo (Liancourt Rocks), but this map shows that it could not have been Dokdo since Dokdo is just rocks without the soil to grow haejang bamboo. Also, Usando was shown as a neighboring island of Ulleungdo, but Dokdo is 92 km southeast of Ulleungdo. Stored in Seoul Nat'l University's Kyujanggak Institute of Korean Studies. Made in the late 1800s, this map shows "Usan" (于山 - 우산) as a neighboring island of Ulleungdo (鬱陵島 - 울릉도). 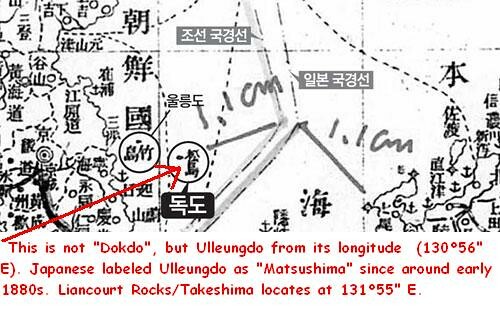 Koreans claim that Usando (于山島 - 우산도) was the old name for Dokdo (Liancourt Rocks), but this evidence agains that claim. The map also says that Ulleungdo is 800 nautical "ri" from the mainland (水路八百里). The map is stored in Korea's Yeongnam University Museum. The map showed Ulleungdo (鬱陵島 - 울릉도) with a neighboring island labeled as "Udo" (于島 - 우도), which was probably a shortened form of "Usando" (于山島 - 우산도). The map was titled "The Famous Map of 'Joseon Yeojido'" (有明朝鮮輿地圖) and is stored in the US Library of Congress. This old Korean map showed Ulleungdo (鬱陵島 - 울릉도) with a small neighboring island just off its east shore labeled as "Usan" (于山 - 우산). Koreans claim that Usando (于山島 - 우산도) was the old name for Dokdo (Liancourt Rocks), but this map is evidence against the Korean claim. Liancourt Rocks is essentially two islands 92 kilometers southeast of Ulleungdo, but the Usan on this map is just off Ulleungdo's east shore and is only one island. In fact, Usando was the old name for Ulleungdo's neighboring island of Jukdo (竹島 - 죽도), which is only two kilometers off Ulleungdo's east shore. This map was made iin 1846 by Kim Dae-geon (金大建), who was Korea's first Catholic priest. He made this map for the benefit of the French priest he works with. He was killed by the Joseon government the same year this map was made. The map shows Ulleungdo labeled in French as "Oulangto" and its neighboring island of Usando labeled as "Ousan." Koreans claim that Usando (于山島 - 우산도) was the old name for Dokdo (Liancourt Rock), but this map shows Usando as one island just of the east shore of Ulleungdo. That tells us that Usando was almost certainly Ulleungdo's neighboring island of Jukdo (竹島 - 죽도), which is only 2 kilometers off Ulleungdo's east shore. Also, this island could not have been Liancourt Rocks since Liancourt Rocks is essentially two islands not one. The original of this map is stored in the National Library of France. This old Korean map showed an island labeled as "Usando" (于山島 - 우산도) just off the east shore of Ulleundo (鬱陵島 - 울릉도). Koreans claim that Usando was the old name for Dokdo (Liancourt Rocks), but this map is more evidence against that claim. Liancourt Rocks is essentially two islands ninety-two kilometers southeast of Ulleungdo, but this map shows Usando as one island just off Ulleungdo's east shore. Usando was, in fact, the old name for Ulleungdo's neighboring island of Jukdo (竹島 - 죽도), which is about two kilometers off Ulleungdo's east shore. This map is stored in Korea's Yeongnam University Museum. This Korean map showed "Usan" (于山) as a neighboring island of Ulleungdo (鬱陵島 - 울릉도). Usando (于山島 - 우산도) was the old Korean name for Ulleungdo's neighboring island of Jukdo (竹島 - 죽도), which is about 2.2 km off Ulleungdo's east shore. Koreans claim that Usando was the old name for "Dokdo" (Liancourt Rocks), which is 92 km southeast of Ulleungdo, but this map and many others prove that claim wrong. The map is stored in Korea's Koryo University Library. This map showed Ulleungdo (鬱陵島 - 울릉도) with a neighboring island labeled as "Usando" (于山島 - 우산도) off its east shore. Usando was the old name for Ulleungdo's neighboring island of Jukdo (竹島 - 죽도), which is about 2.2 km off Ulleungdo's east shore. Koreans claim that Usando was the old Korean name for Dokdo (Liancourt Rocks), but this map and many others prove that claim as false. The map is stored in Korea's Koryeo University library. This old Korean map shows Ulleungdo (鬱陵島 - 울릉도) with a small neighboring island just off its east shore labeled as "Usando" (于山島 - 우산도). Koreans claim that Usando was the old name for Dokdo, but this map is evidence against that claim. Liancourt Rocks is essentially two islands ninety-two kilometers southeast of Ulleungdo, but the Usando on this map is one island just off the east shore of Ulleungdo. Usando was, in fact, the old name for Ulleungdo's neighboring island of Jukdo (竹島 - 죽도), which is about two kilometers off Ulleungdo's east shore. This map is stored in the Korean National Museum. This is a clever video. The Diplomat: "Why Dokdo Matters to Korea"
1876/77 - Watanabe Kouki's "Opinion on Matsushima - 2"